ORCID provides a persistent digital identifier that distinguishes you from every other researcher and ensures that your work is recognized by linking you to your professional activities. Unlike other research IDs, your ORCID iD is universal. It's not tied to any institution or database, and it can follow you wherever your research takes you. Publishers, funders, research institutions, and other organizations are increasingly adopting or supporting ORCID. Once you've created your ORCID iD, it's easy to add your scholarly works to your ORCID record, enable automatic updates, and delegate management of your record to someone else. Find out more! Include your ORCID identifier on your webpage, when you submit publications, apply for grants, and in any research workflow to ensure you get credit for your work. Find out more! Cornell would like you to link your ORCID to Cornell so that published works can be easily identified as belonging to Cornell Faculty and Staff. This allows CALS and the University to have more accurate data pertaining to publications. 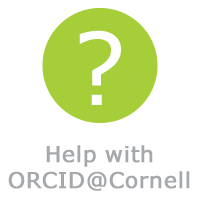 Follow this step-by-step tutorial from CALS to sign-up for your ORCiD ID and link to Cornell.